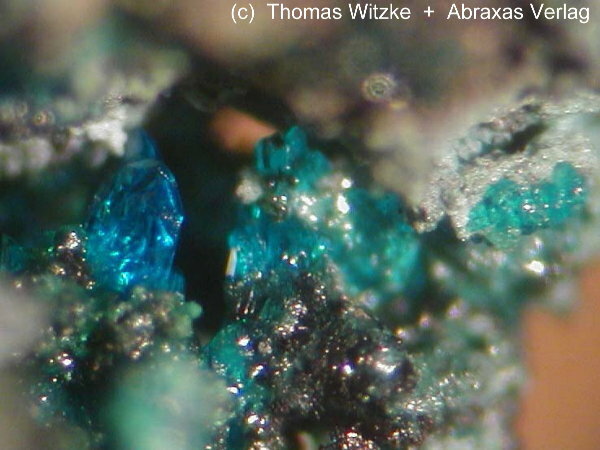 Chalcomenite: Mineral information, data and localities. Intense blue; pale blue in transmitted light. From the Greek χαλκος = "copper," and μήυη (for σελήυη) = the "moon." 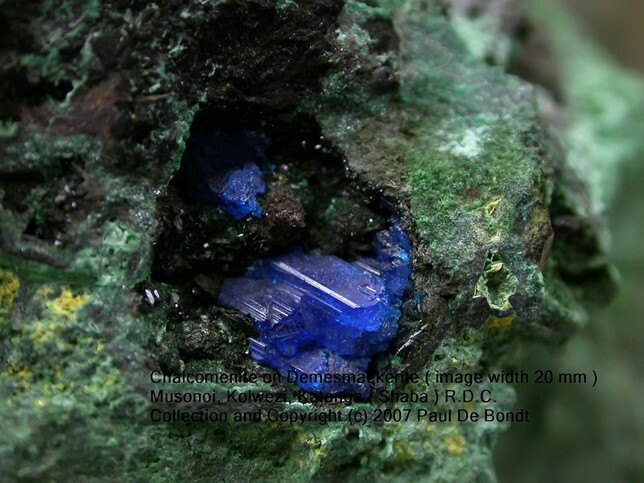 This page provides mineralogical data about Chalcomenite. Measured value on Hiaco Mine material. Crystals minute, acicular . The prismatic faces are often striated or rounded. Umangite 16 photos of Chalcomenite associated with Umangite on mindat.org. Demesmaekerite 8 photos of Chalcomenite associated with Demesmaekerite on mindat.org. Malachite 6 photos of Chalcomenite associated with Malachite on mindat.org. Cerussite 5 photos of Chalcomenite associated with Cerussite on mindat.org. Olsacherite 5 photos of Chalcomenite associated with Olsacherite on mindat.org. Clinochalcomenite 4 photos of Chalcomenite associated with Clinochalcomenite on mindat.org. Krut'aite 4 photos of Chalcomenite associated with Krut'aite on mindat.org. Derriksite 4 photos of Chalcomenite associated with Derriksite on mindat.org. Tyrrellite 3 photos of Chalcomenite associated with Tyrrellite on mindat.org. Ahlfeldite 3 photos of Chalcomenite associated with Ahlfeldite on mindat.org. Des Cloizeaux and Damour (1881) Bulletin de la Société française de Minéralogie: 4: 51, 164. Friedel and Sarasin (1881) Bulletin de la Société française de Minéralogie: 4: 176, 225. Dana, E.S. (1892) System of Mineralogy, 6th. Edition, New York: 980. Groth, P. (1908) Chemische Krystallographie. Leipzig. 5 volumes: vol. 2: 300. Goldschmidt, V. (1913) Atlas der Krystallformen. 9 volumes, atlas, and text: vol. 2: 132. Larsen, E.S. (1921) The Microscopic Determination of the Nonopaque Minerals, First edition, USGS Bulletin 679: 55. Palache, C. (1937) American Mineralogist: 22: 790, 1123. Palache, Charles, Harry Berman & Clifford Frondel (1951), The System of Mineralogy of James Dwight Dana and Edward Salisbury Dana Yale University 1837-1892, Seventh edition, Volume II: 638-639. Tschermaks Mineralogische und Petrographische Mitteilungen: 24: 287-298. Krivovichev V. G., Tarasevich D. A., Charykova M. V., Britvin S. N., Siydra O. Y., Depmaier W. (2011): Thermodynamics of arsenates, selenites and sulphates in the sulfide ore oxidation zone. V. Chalcomenite and its synthetic analogue, properties and conditions of the forming. Zapiski RMO (Proceedings of the Russian Mineralogical Society) 140, 1-9. The following Chalcomenite specimens are currently listed for sale on minfind.com. American Mineralogist 35 (1950), 354; Palache, C., Berman, H., & Frondel, C. (1951), The System of Mineralogy of James Dwight Dana and Edward Salisbury Dana, Yale University 1837-1892, Volume II: 639; Economic Geology (1997) 92, 468-484. Palache, C., Berman, H., & Frondel, C. (1951), The System of Mineralogy of James Dwight Dana and Edward Salisbury Dana, Yale University 1837-1892, Volume II: 639. Des Cloizeaux and Damour (1881) Bull. Soc. Fr. Min. : 4: 51, 164; Palache, C., Berman, H., & Frondel, C. (1951), The System of Mineralogy of James Dwight Dana and Edward Salisbury Dana, Yale University 1837-1892, Volume II: 639. Lheur, C. (2016) - Nouvelle occurrence française de minéraux séléniés : la munakataite et la chalcoménite de La Vidale, Asprières, Aveyron, France. Le Règne Minéral, 127, 19-21. Francis, J.G. & Ryback, G. (1987) Mineralogical Magazine, vol. 51, 751.; Ryback, G., Nawaz, R. and Farley, E. (1988) Seventh Supplementary List of British Isles Minerals (Irish). Mineralogical Magazine, vol. 52, n° 365, pp. 267-274. Self collected by Brent Thorne and EDS and XRD analyzed. [MinRec 16:63]; Jensen, M. (1993): Update on the mineralogy of the Majuba Hill mine, Pershing County. 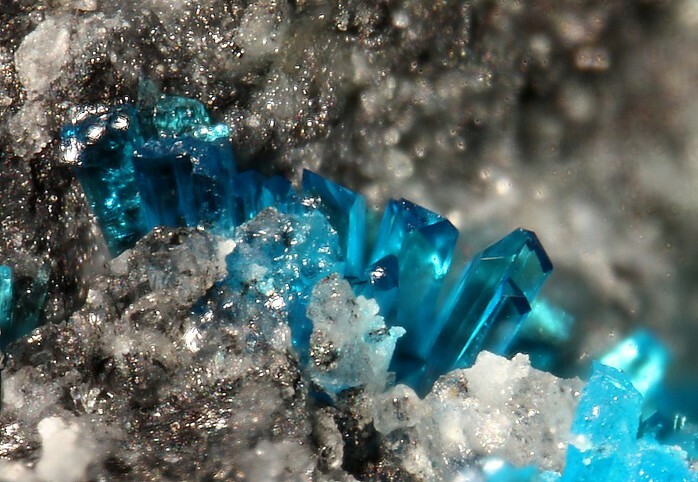 Mineralogical Record. 24, 171-180. Collected by and in the collection of Brent Thorne. EDS confirmed.